The Seeds Have Arrived! The Seeds Have Arrived! 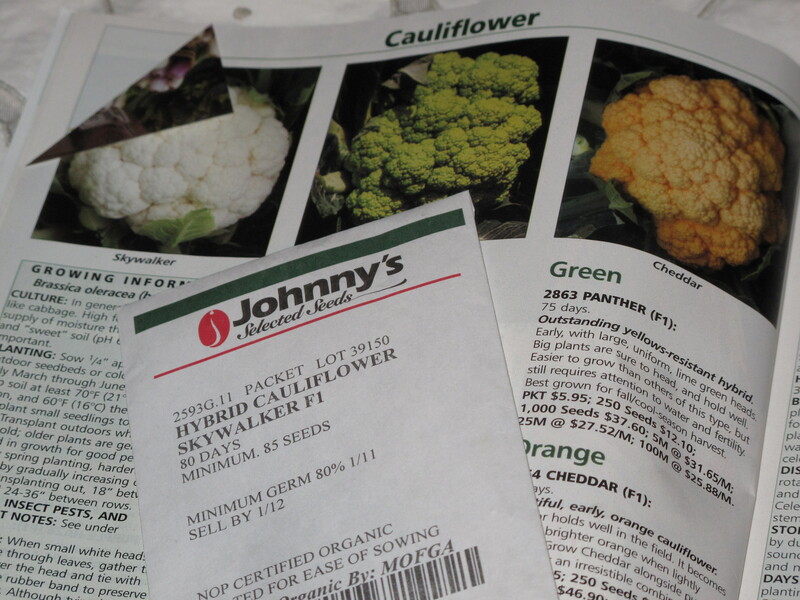 Skywalker F1 Organic Cauliflower – best organic variety for fall harvest. Uniform, medium-sized, self-wrapping heads. I will start this one indoors under my grow light and place outside in mid to late-May. Tendersweet F1 Cabbage, Early Green – midsize, flat heads stand well without splitting. Leaves are thin, sweet and crisp. I will start this one indoors under my grow light and place outside in mid to late-May. 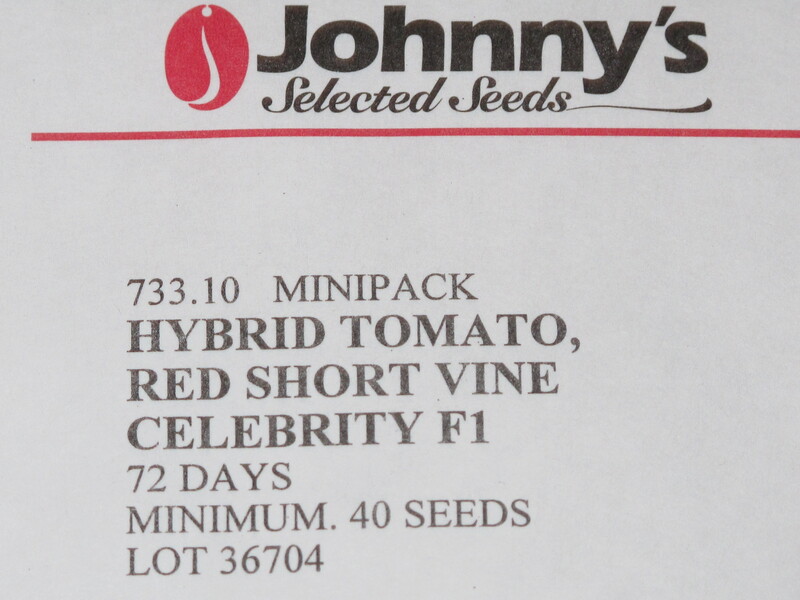 Celebrity F1 Tomato, Red Short Vine – my father’s favorite tomato to grow. Medium-large, 7-8 ounce tomato. Flavorful, globe-shaped, firm red fruits that ripen mid-season. I will start this one indoors under my grow light and place outside in mid to late-May. Granadero F1 Organic Tomato – wanted a great sauce tomato. Produces a uniform, attractive, bright red fruit, 4-5 ounces in size. Thick-walled construction makes it good for sauce. I will start this one indoors under my grow light and place outside in mid to late-May. Allstar Gourmet Lettuce Mix Greens, Salad and Braising Mix – Johnny’s most popular brand of salad greens. Able to hold its color and resist mildew. Made up of Green Oakleaf, Red Oakleaf, Green Romaine, Red Romaine, Lollo Rossa, Greenleaf and Redleaf lettuces. Rover F1 Radish, Small Round Red – a great round red radish. Smooth, round, dark red roots with a crisp, snow-white flesh. D’Avignon Radish, Speciality – a traditional variety from Southern France. 3-4 inches long with a mostly red root, but with white tips. Bull’s Blood Organic Beet, Heirloom – this beet shows a candy-striped root and the leaves are dark red and can be used to jazz up your salad. This variety is often listed on different garden websites as one of the best. Touchstone Gold Organic Beet, Specialty – this beet shows smooth roots that are golden in color, even when cooked. Sweet flavor. Leaves are green in color. Nautic Organic Brussel Sprouts – a full-season sprout for late fall harvest. Medium sized sprouts with an excellent taste. I will start this one indoors under my grow light and place outside in mid to late-May. Purple Top White Globe Organic Turnip – this is a traditional American turnip. Smooth, round roots, 3-4 inches in diameter, that are white below the soil line and bright purple above. Copra Organic Onion Plants F1 – onions are easier to grow from pregrown, spring dug plants. These will be live onion plants delivered in May. 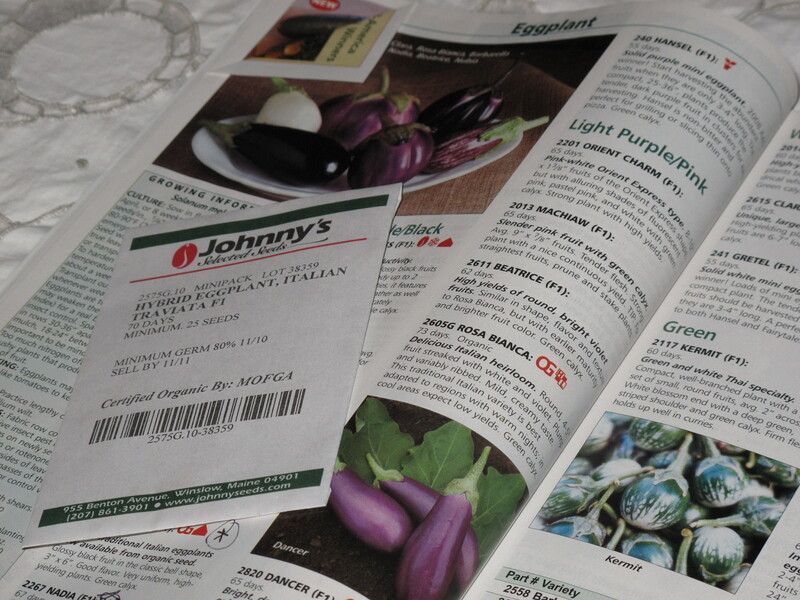 Traviata F1 Organic Eggplant, Italian – traditional Italian eggplants from organic seed. Glossy black fruit in classic bell shape. I will start this one indoors under my grow light and place outside in mid to late-May. F1: F1 refers to “first filial” or first generation offspring. Hybrid varieties of vegetables and flowers are typically F1 hybrids. Hybrids are the offspring of a cross between two or more varieties, usually of the same species. Hybrids are developed by the long, slow process of traditional plant breeding, which relies on natural reproductive methods. Hybrids are crosses between two or more parents with different desirable traits. Pollen from one parent plant is transferred to the flowers of the other parent plant. The seeds that develop are an F1, first filial generation, hybrid. HEIRLOOM: An old variety that owes its present availability to the seed-saving efforts of amateurs. UNTREATED: Seeds that have no chemical treatments. All seeds in my order were specified to be untreated. Blue Lake Bush Bean – this dark-green bean has been a standard for over 40 years. The bush plants set heavy yields of flavorful pods that are tender and crisp. Developed in 1961 from the Pole Blue Lake. 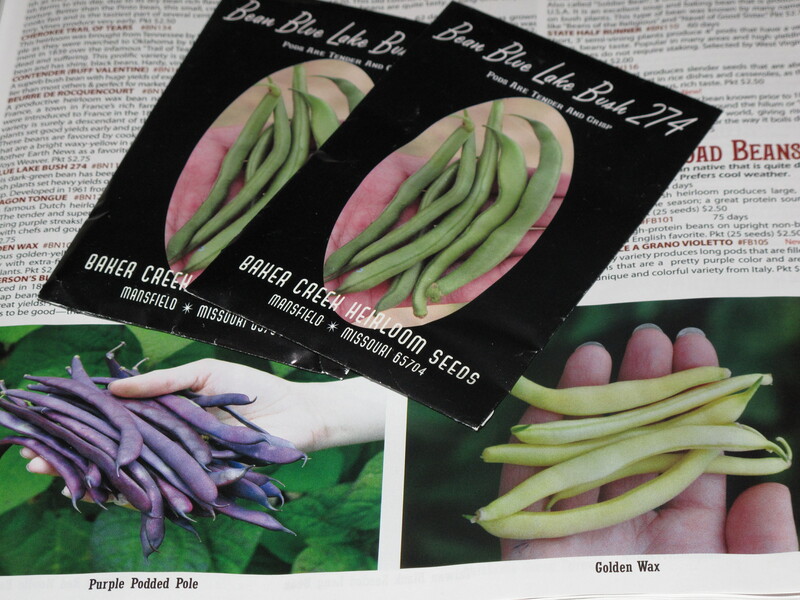 I ordered these because they are listed on many garden websites as one of the best bush bean to grow. You might see some obvious exclusions in my orders. No peppers, squash or broccoli–I’m not really a fan of these popular vegetables. Sweet corn, peas or cucumbers–not sure I have enough room in my garden. You need a lot of these to get enough to eat and I have some space limitations. Carrots–a lot of gardeners I talk to say it is just easier to buy organic carrots at the supermarket. I take orders well, so I’ll believe them. As Spring gets here, I have so much to share about my 2011 garden in the next few weeks. I am busy! I would imagine you are as well with your gardening chores. What are you doing now to get ready for your 2011 garden? This entry was posted in The Garden-2011 and tagged Food. Bookmark the permalink. If you like cucumbers, try growing them on a trellis. They take up little space and are easy to keep picked. I plant 3 or 4 vines [a 9-12 foot row} and feed me, my daughter(s) family and still have a sack or 2 to give away to friends every week. Thanks for the comment pobept. That sounds like a great solution for my garden space limitations. Come visit us again at Acorns On Glen. I hope one of you start cooking and are up to the task. Sounds good Louisella. I knew that thing called a stove was good for something. Come back and comment again. It appears to me that I am looking at a lot of work, but if you have taken it for a hobby it will be fun work. Also very good to eat. In my lifetime, I have always had the advantage of a garden with beautiful vegetables. Not one I grew, but my father and then my husband who plants enough for everyone and loves to give it away. Enjoy your garden and the fun in taking care of it and serving it on your table. Thanks so much for your comment Carolkin. It’s not work….I really love it. I think I will have a lot and also have lots for the neighbors. Come back and visit soon.